Snuggle with my kids and smother them with kisses. They agree! Oh, and I’m a pretty good tickler too. I’m the best version of myself when I take the time to take care of myself. I’ve found that the people with great habits of wellbeing have one important quality in common – discipline. Everyone is on their own personal journey, as am I. Now I know the importance of holistic health and so taking care of myself now involves a variety of things. In recent years, this has meant daily meditation, a good night’s sleep, a healthy diet, and a combination of weight training and yoga. I also try not to overbook my schedule. I now recognize the importance of having some space and how this relates to my ability to be present and calm for my kids and everyone in my life. I try hard to avoid treating everything as urgent and necessary and I’ve let go of some of my need for control. If I take the time to care for my dimensions in a balanced way I feel that I am a better person and the best version of myself. Now that my book is published after five long years, my business aspiration is to inspire conversations around what it means to lead, holistic wellbeing, and conscious leadership that lead to a shift in how hiring decisions are made, how we take care of ourselves, and a return to humanity in the workplace. I’m also excited about staying involved in the investment industry as it continues its own evolution and with entrepreneurs. I look forward to watching SRI and impact become naturally embedded into the investment due diligence process and entrepreneurs forming conscious companies. My personal aspirations are to get into firefly and scorpion poses! Well actually they are not my aspirations. But I do want both my spiritual and physical yoga practice to continue to grow. Importantly, I aspire to maintain as best I can the sweet, close, loving relationship that I have with my little kids now as they get older and maintain a trusting bond with my husband. Well success is defined individually so it really has no meaning as a word on its own no matter what Webster says! So, what is my greatest accomplishment? Personally, of course, as a parent I must look to my kids as part of my success story. I first felt ‘successful’, a.k.a. I did a pretty good job, when, in the same year, each of my kid’s teachers told me almost shockingly how polite they both were. And that year my son won the ‘polite’ award in school. We place a high priority on respectful communication in our household. I wish everyone did that. 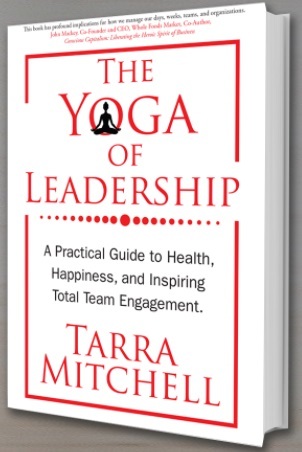 Committing to do the work over five long years to bring the teachings of yoga to a broader audience in my new book has to be one of my greatest professional accomplishments to date. There was a time when I had to decide whether I would step up and let my company know that a member of their leadership had sexually harassed me. Honestly, this felt like a huge risk. I felt that I could be throwing away my very hard-earned career. But I did it for all the women younger than me, the future victims. That’s what gave me the strength to do it. But importantly, I smartly negotiated a higher-purpose benefit in exchange for this leader’s inappropriate behavior. And that higher-purpose benefit continues to help many female leaders that came after me. It had a meaningful impact on my life because I saw how taking actions in consideration of the highest possible outcome and thinking beyond consequences to one person could yield rewards and satisfaction lasting for years. We should have many different role models – people are human. I don’t believe there is one person we should look to as our only role model. My mentors are my role models. I’ve always surrounded myself with good mentors related to whatever I was doing. So, I look for qualities in people that I want to emulate. I look for inspiration from others. And then I try to model those qualities that I find noble, effective, or inspirational for example. Both my mother and my father make good role models. They are both selfless, giving, and go out of their way to help others. My mother is so strong; I admire her for the life she managed to create for me and my sister. I admire my father’s tremendous will power to overcome both alcohol and smoking addictions in this lifetime. This is a tough question because I’m a creature of the world and love many places. For personal retreats I love Sedona, Arizona and Kripalu in the Berkshires. For family travel, I’ve loved Hilton Head. For adult travel, of course Paris and Rome both top my list. I really enjoy the yoga studios where I practice and the personal training studio that I go to. Of course, there’s no place like home! Current faves: My Manduka yoga mat. My KiraGrace leopard print yoga pants. Whole Foods Market. Banyon Botanical sesame oil and nasya oil. Beauty Counter face oil. DoTerra peppermint oil. My iPhone! I suppose this book has been my passion project and I’m excited to watch its release into the world. So, I’d have to say I’m passionate about everything in it: holistic health, yoga, fitness, nutrition, mental health, meditation, principled living, personal growth and simply, being the best we can be in this lifetime!